Yesterday (2012 March 18th) I got my bike (the Kuwahara mountain bike) out for the first time this year and as I noticed later, this day was also the last full day of winter here in Edmonton. For a first time out it wasn’t bad. I of course felt out out of shape after not being on a bike for 4 months but It felt great to be out there anyway. Thinking back to my first rides of the last couple of years, the roads/trails were a lot drier this year thanks to the relatively light winter snowfall accumulation. The temperature this afternoon was about +3C and the skies were clear. It has become traditional that my first ride each year takes me from central Edmonton, through Dawson Park, along Ada Boulevard and around Rundle Park (and then back). Being on the northside of the river and thereby getting good sun exposure, this route is usually the first to be clear of snow. This year’s conditions were pretty decent. 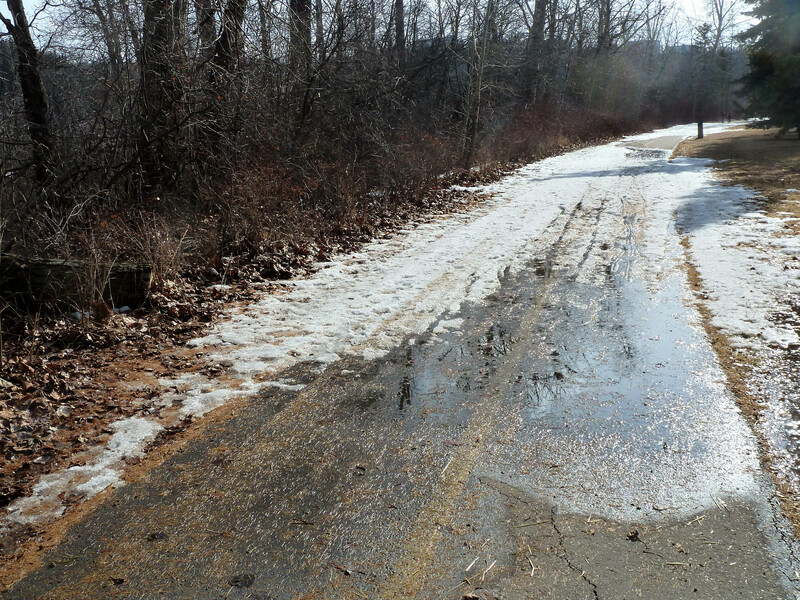 Along the bike path through Dawson Park, I encountered some wet spots, a few puddles and sand but no snow or ice on the trail. 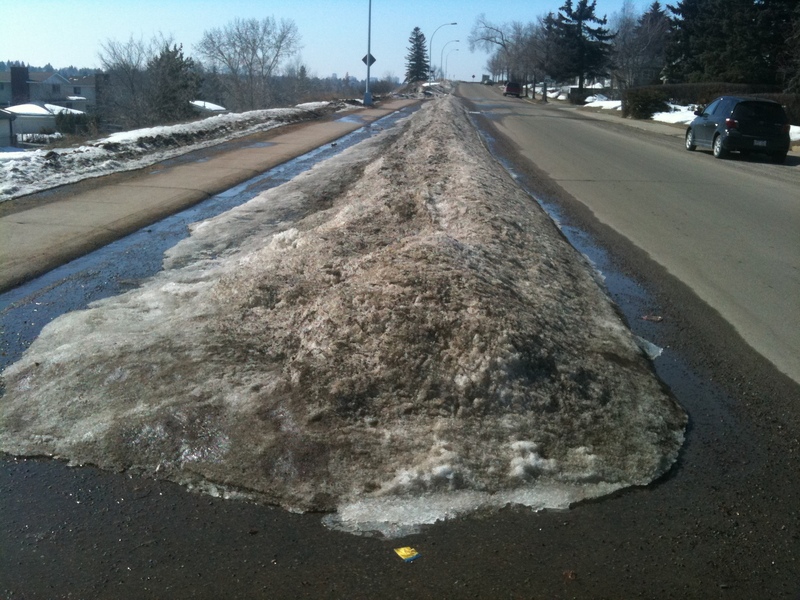 Likewise once I got up to Ada Boulevard and traveled the roads on the top of the bank, I found them to be virtually ice free with just a bit of wetness. The sand was the only hazard, making the couple of meters of the road next to the curb a bit dangerous and best to be avoided. This however was not an issue on this lightly traveled residential road. Descending into Rundle Park I noticed that the fields were clear of snow and the paths pretty much dry. There was still ice on the skating pond (with “thin ice” hazard signs posted). In Rundle Park I cycle clockwise around the big loop. The path continued to be dry from the main building and the ACT Centre. 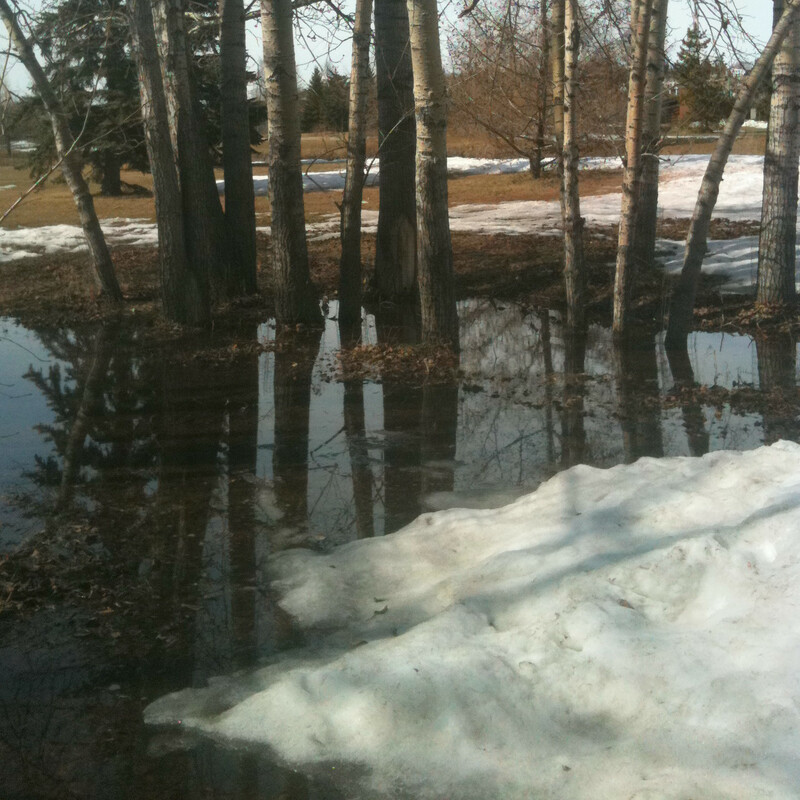 Last year, just north of the ACT Centre I recalled a huge pond that stretched across the path, with snow in the filed on either side. This year, the same spot and again there was a big (but much smaller) puddle across the path but it was an easy matter to cycle up on the grass to get around it. The only challenging part of the ride was the trail on the east side of the park beside the river. There were a few snowy stretches that made the riding difficult (particularly on my slick tires). A couple of times I had to put my foot down before I went down. Putting my foot down in the icy slush probably did contribute to my very cold feet – they were numb by the end of the ride! Otherwise I seemed quite adequately dressed for the weather – wearing long pants, a long sleeve wool jersey under a wind-proof jacket, full finger “winter” cycling gloves and a liner under my helmet. It was just a week-ago that I was out on my cross-country skis and now another cycling season has begun. I like how even with temperatures just above freezing, some snow and puddles on the path and sand on the road, the first ride of the year is so wonderful! Two weeks ago when I last rode I developed a slow leak in my rear tire. Over the last couple of kilometers, the pressure fell and the riding got increasingly difficult – but I was able to ride home. The tire did go completely flat, so it had to be repaired before I could take the bike out on the road again. On Saturday, I gave the tire a thorough inspection looking for any obvious sign of a puncture – there was nothing obvious. There were a number of grains of sand stuck in little grooves in the almost slick tires but those would have not caused a problem. Looking closer I found probably half a dozen tiny but sharp little dagger of sand that had penetrated the tire. I pulled these out but it didn’t seem like any of them were long enough to go all the way through to the tube – especially when I had a layer of Mr. Tuffy between the tire and tube. 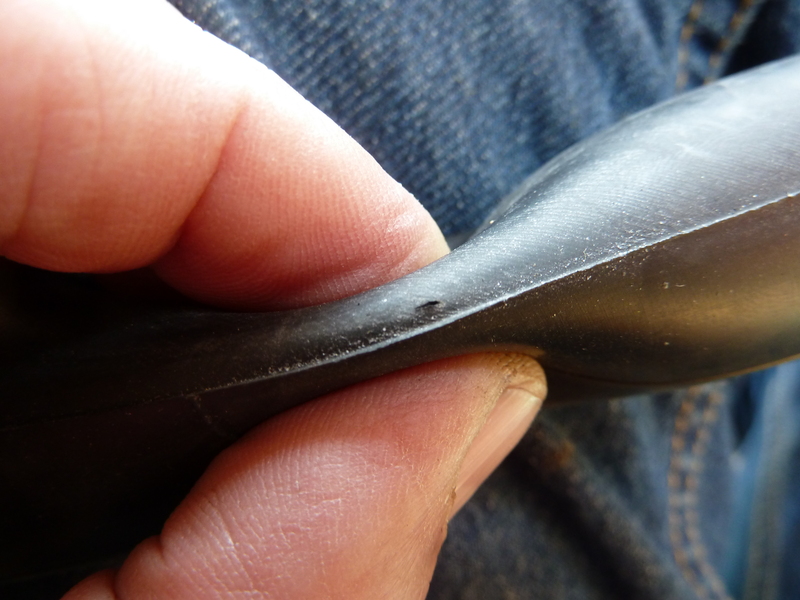 Next I took the tube out of the tire, inflated it and gave a visual inspection – still nothing seen. I put a little more air in the tube and very carefully inspected it, listening for any hissing. That worked, I did not have to resort to putting the tube under water and looking for bubbles. the whole was very tiny (maybe 1 mm long) and virtually impossible to note without the tire being stretched. I patched up the hole but decided to put in a brand new tube just to be safe. I didn’t want a repeat puncture so I tried to analyze what caused this one. It”s possible, but I think unlikely, that one of those shards of sand embedded in the tire caused the puncture. My best guess (unlikely as it seems) is that a piece of sand worked its way in through the opening at the valve stem (Schraeder valve). In any case I was cleaning out the inside of the tire and the protection strip. I didn’t notice any sand, just rubber crumbs. In any case, the new tube was mounted, tire inflated and all seemed fine. I lubed up the chain again and headed out onto the trails and road. Today’s ride was the same 20K loop (between Dawson and Rundle Parks) that I’ve done for my last couple of outings – but today was faster. It was sunny and 14 degrees Celsius so I was able to ride in shorts for the first time. It also helped that the paths and road were very dry. With my tires at rated pressure I felt like I was flying. 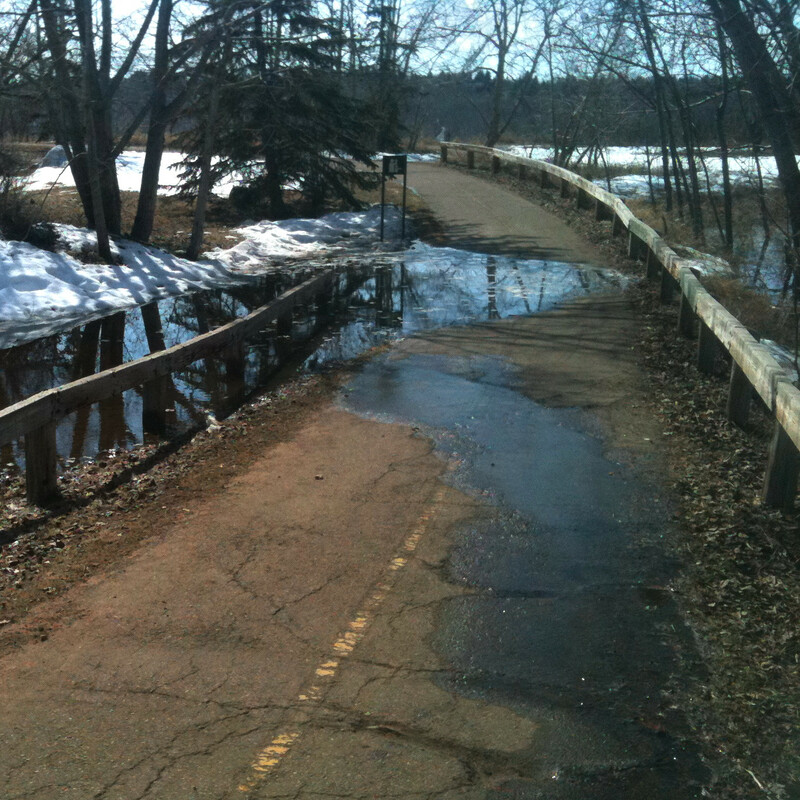 There were a few places where snowmelt run-off was flowing across the path (particularly just north of Dawson Bridge. For the most part though the paths were completely dry. 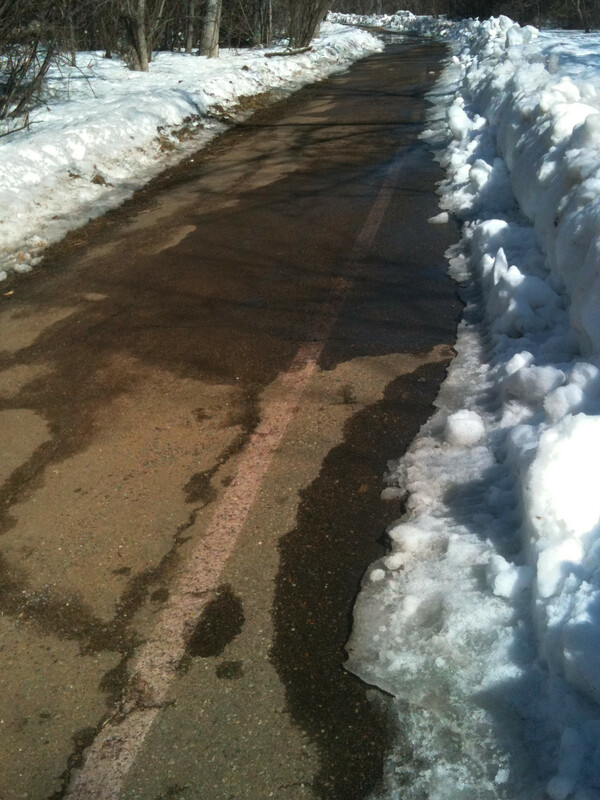 The bike path through Dawson Park was also surprisingly clear of sand. I do think it must have been swept recently. the main road on this route, Ada Boulevard was also very dry. It however was still very sandy. The sand basically took out the south most lane of this road but with minimal traffic this was not an issue. 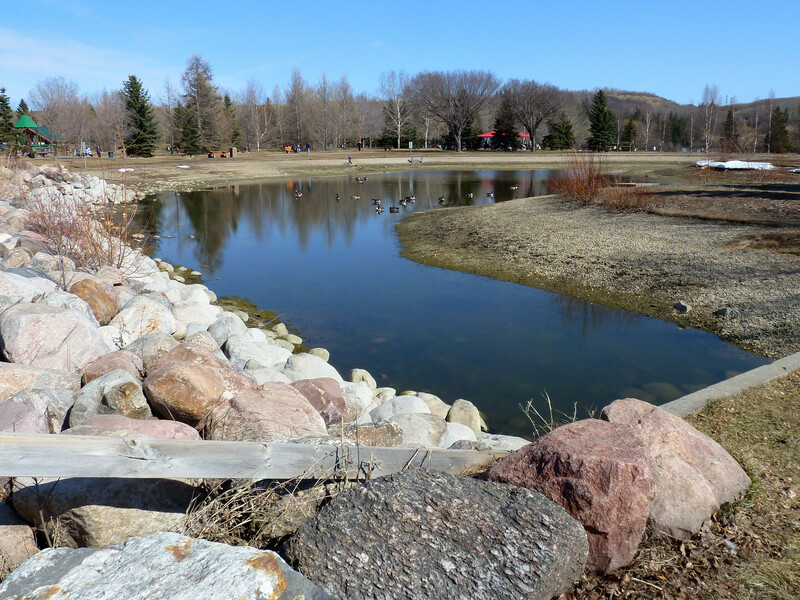 Even Rundle Park, which had large sections of flooded paths 2 weeks ago, was now perfectly dry. This ride was also my first opportunity to test a new point and shoot camera that I have bought, specifically to have something small that I can take with me cycling. In a future blog I’ll write more about what I was looking for, what I got and what I think about it. 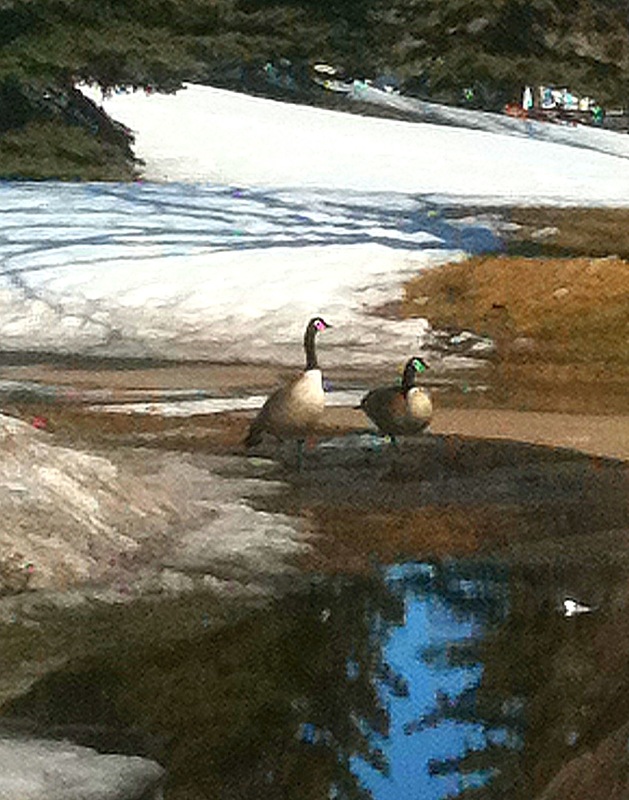 As you can see from the photos, the Edmonton landscape on this last Sunday in April, has not yet started to green-up. Nonetheless we are moving in the right direction and the cycling season is young. Today (Sunday April 10) I got out on my bike for the third time this year. I rode the same route as I had a week earlier – but what a difference. While last week’s ride was slow, careful and deliberate, today I felt like I was really riding. 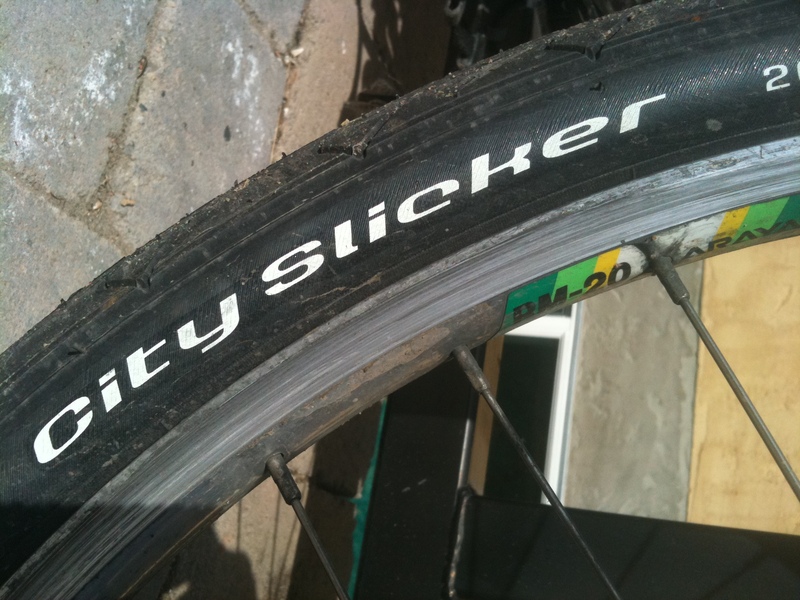 I’d forgotten how well my mountain bike move with the City Slicker tires. I was cruising along at 25 Kmph along some stretches and it felt good! Before I could hit the road I had to clean up my bike a bit. 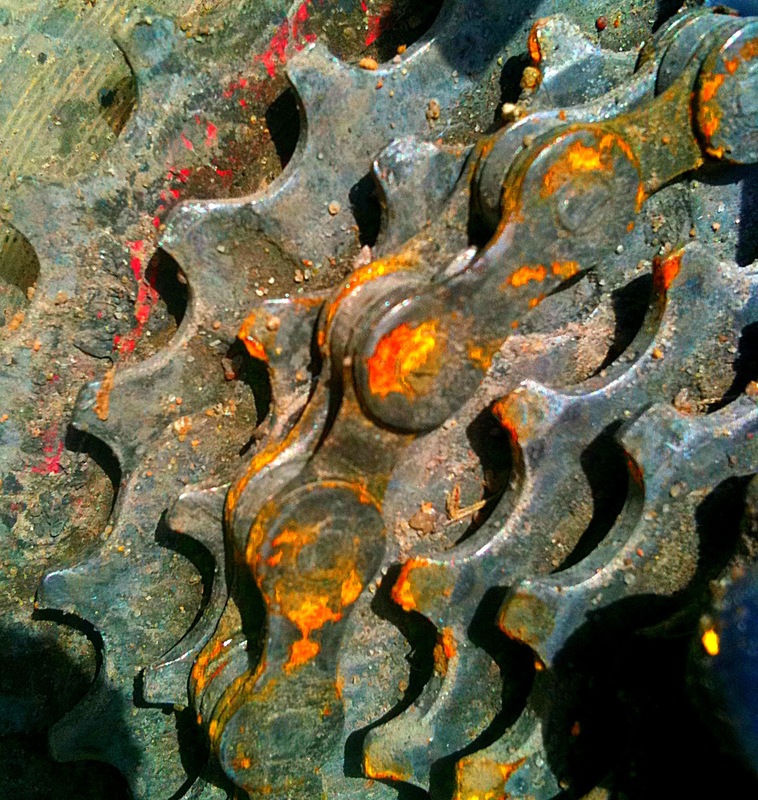 Last weekend’s ride had left it very sandy and this was especially an issue on the drive train. I knocked off as much dirt and sand as I could then applied some White Lightning lubrication to the chain. 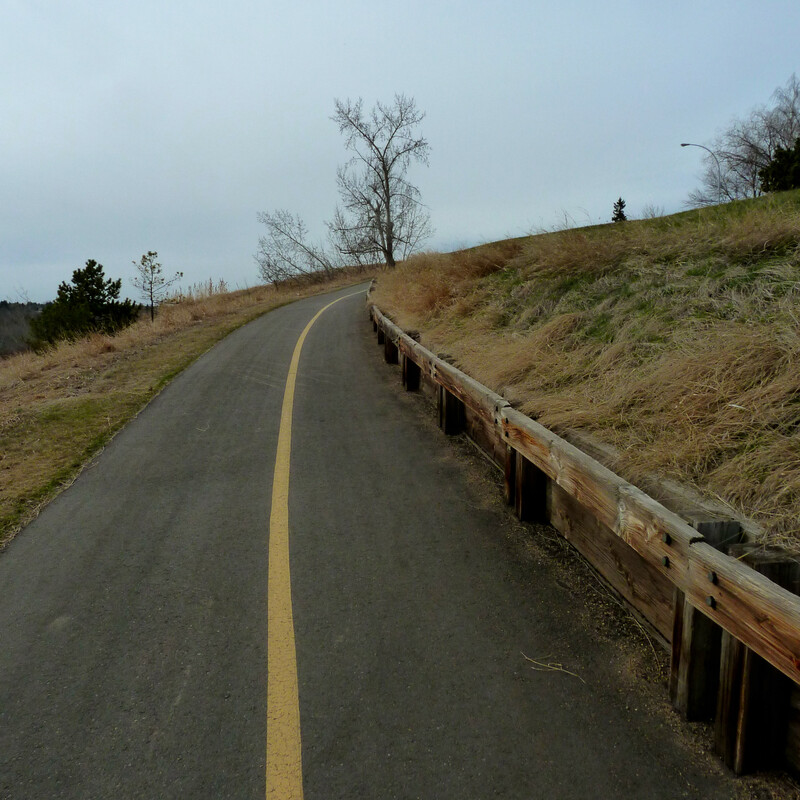 The route I took was along the bike paths and connecting roads from Dawson Park in central Edmonton to Rundle Park in the east end of the city. The first difference notices was that the paths in general were much drier and almost completely free of snow and ice. Last week I found the most dangerous part of the trail being a very muddy section beside a construction site in Dawson Park. Today this section was a bit dirty but dry – no issue. 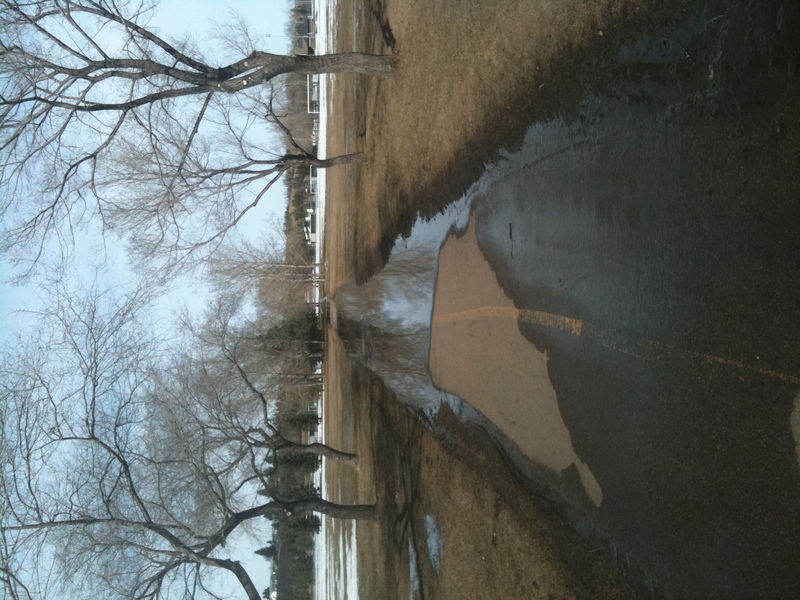 Through Dawson Park and up the trail beside the Highlands Golf Course, the path had a few wet spots – either puddles or sections where the run-off flowed across the path. There was also still a lot of sand on the path. Once I got up to to Ada Boulevard I traveled on the relatively quiet residential street. Again there was a lot of sand on the road but for the most part the the surface was dry and fast. The biggest thing to watch out for was the pedestrian traffic: runners, dog walkers and strollers. Overall, the few kilometers along the street were a pleasure. This is where I got up a good pace, a good rhythm and felt wonderful. 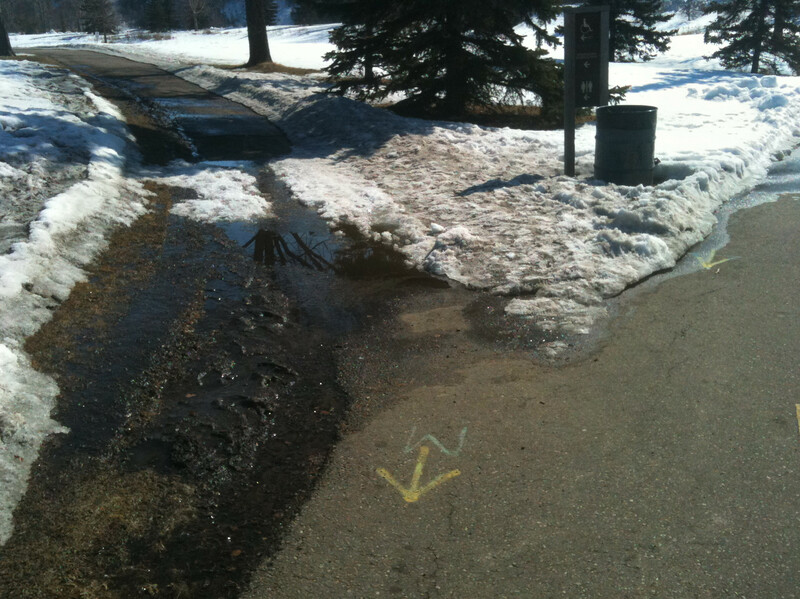 Reaching the turn-off down into Rundle Park the only obstacle encountered was water completely across the path about half way down. 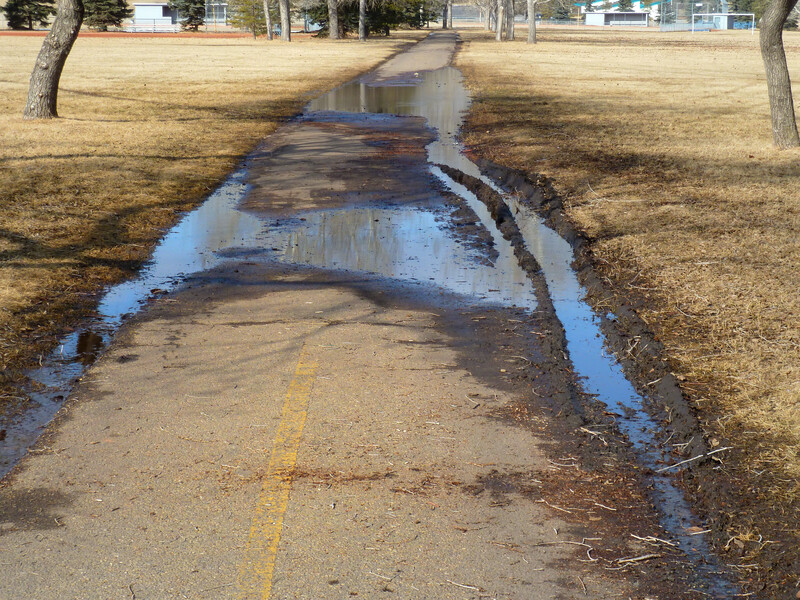 This was the first (and probably the smallest) of a number of small patches of water across the path in Rundle Park. It was just a matter of going slow. I wouldn’t want to have been cruising down the hill at a significant speed and hitting this patch of water. One of the neat parts of slowing down was seeing the pond amongst the trees beside the path – great reflections! 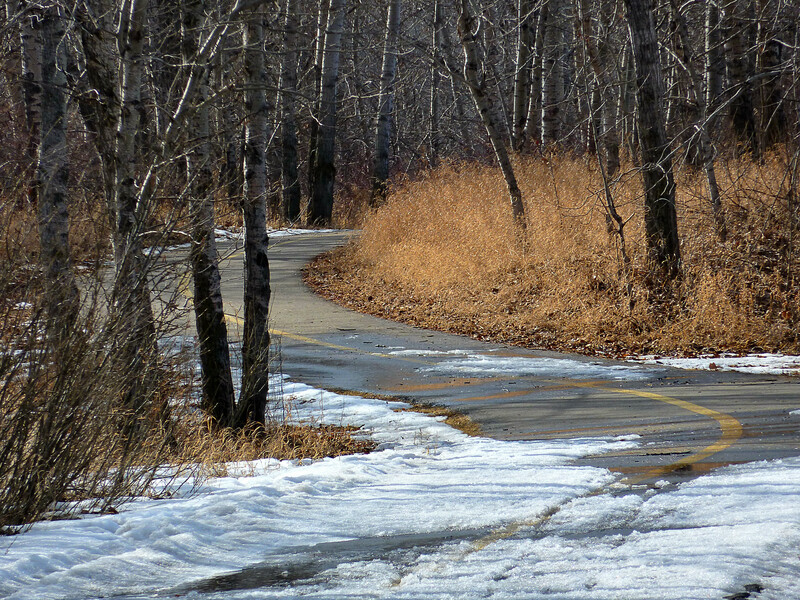 The trail down onto the flats of Rundle Park was completely clear of snow. It was amazing how much snow had melted in just a week. I was most curious to see if the large patch of water across north of the ACT Centre had drained or dried up. 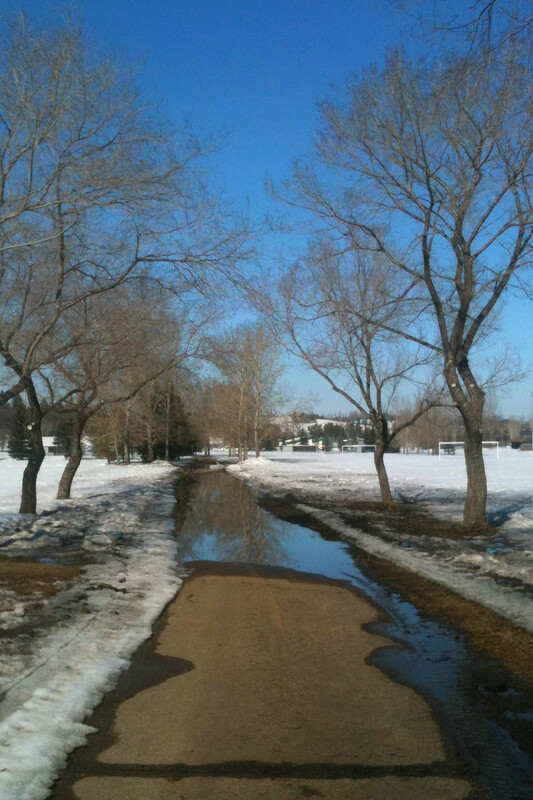 Alas, although a lot of snow was gone, the path was still a low spot filled with water. At least this week it seemed like a reasonable alternative to go off-pavement and ride along the grass beside the path – but I didn’t. since it had worked fine last week I just coasted slowly straight down the path. The ride back to Dawson along the same route was very similar – fast back along Ada Boulevard. The only issue, downside to today’s ride came in the last kilometer or two. I notice that I wasn’t moving as smoothly as I had been earlier. I thought I detected something wrong with my rear wheel – perhaps the hub. I eventually noticed that my rear tire was very low. It didn’t go completely flat, I was able to ride home on it but my speed dropped to about half. A quick inspection did not reveal the problem – no obvious puncture or other cause. I will have to do a closer inspection of the tire later this week, once it is dry. Overall, a good 20K ride. It was about 8 degrees and sunny this afternoon. I was tempted to ride in shorts but stuck with my long tights. I was glad I did because my legs would been pretty cool after getting wet from the spray of riding through puddles. I rode with regular half-finger cycling gloves and without a hat under my helmet and felt very comfortable. I’m looking forward to my next ride! Today, Sunday April 3rd I continued my early season exploration of cycling conditions. Yesterday I had gone west from downtown along the north side bicycle paths. 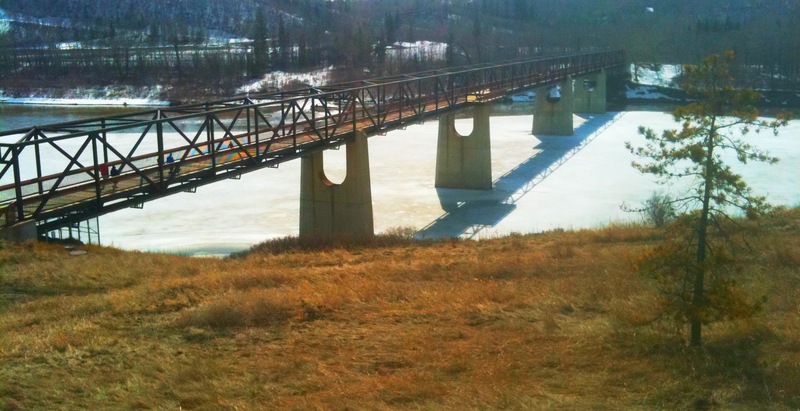 Today I made the journey east – basically from Dawson Park to Rundle Park. 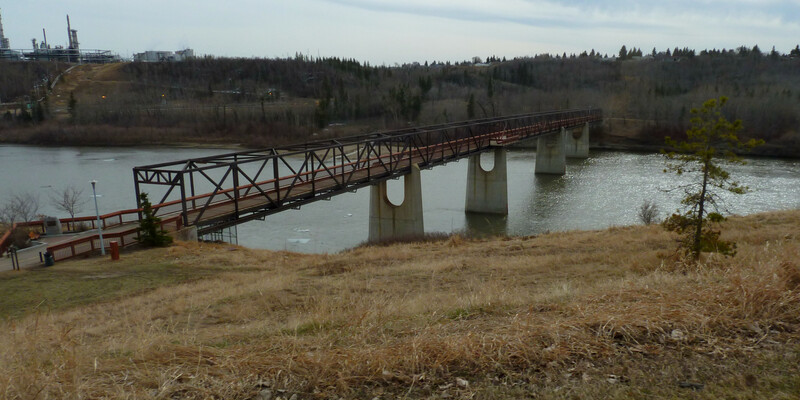 The first section of today’s ride was along the path through Dawson Park on the north bank of the North Saskatchewan River. The path had been plowed through the winter and is relatively exposed to the spring sun so there was not “much” snow and ice. These was however lots of snow on the sides of the trail and sometimes those sides spilled over onto the path. There was also plenty of run-off water in places and lots of sand over the pavement. For the most part the route was quite passable but there was one stretch of maybe 50 meters, beside the construction site that is worthy of note and caution. 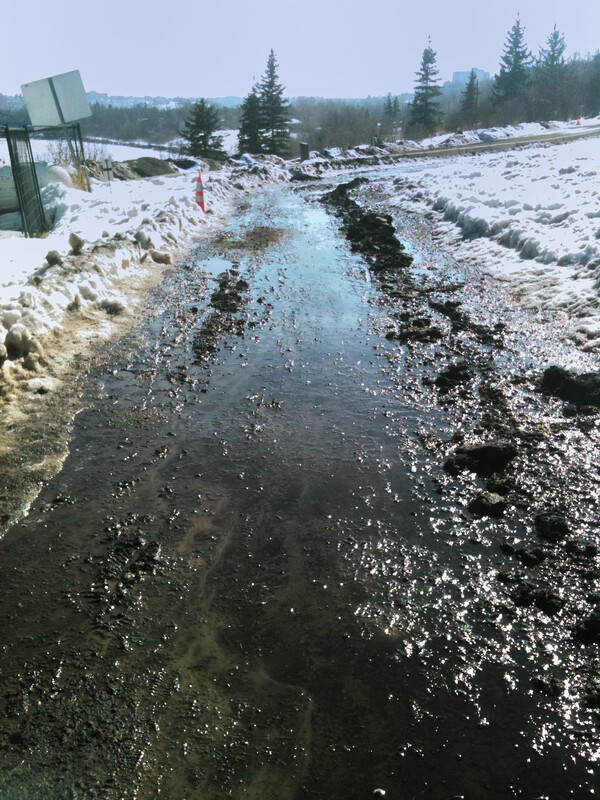 The path just east of and beside the constructions site is very muddy – mud, water, loose snow and ice. It was difficult to tell quite what I was riding over – but by taking it slow and easy over this, I got through. 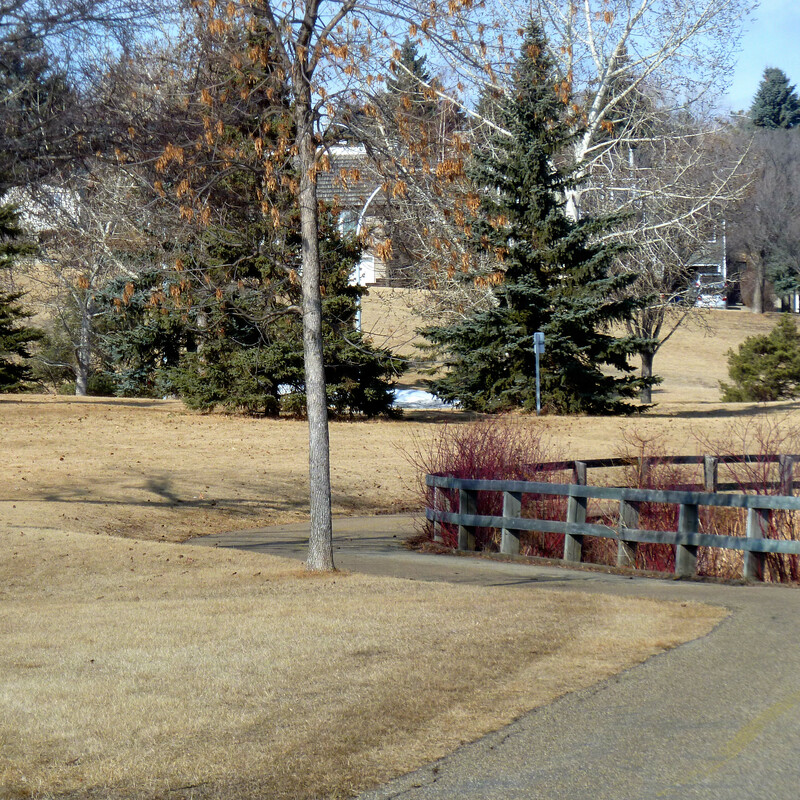 Coming out of the east end of Dawson Park, the path winds up past the west end of the Highlands Golf course to reach Ada Boulevard. This section of the trail is sheltered by tree so it wasn’t surprising to discover the path partially covered by snow. Cycle and pedestrian traffic was relatively light this Sunday afternoon so I encountered no issue with one lane being blocked. The descent into the west end of Rundle Park had worried me but was fine. There was one small section of water across the trail at the bend, but since the trail was clear and ahd been which was resurfaced last year the descent was safe. Now Rundle Park was interesting. I did the loop clockwise around the park. Just as I entered the loop I encountered one little hazard. There was a small gap in the snowed-across trail. I took this gap and then realized that there was ice beneath the water – a bit of a slip but it was such a small section I was through it before I knew it. Around the bends of the little lakes I ran into a different kind of hazard – wild life! The path was completely flooded for maybe 20 or 30 metres, then there was a brief dry section and another big lake. I briefly considered my options for getting by this obstacle. 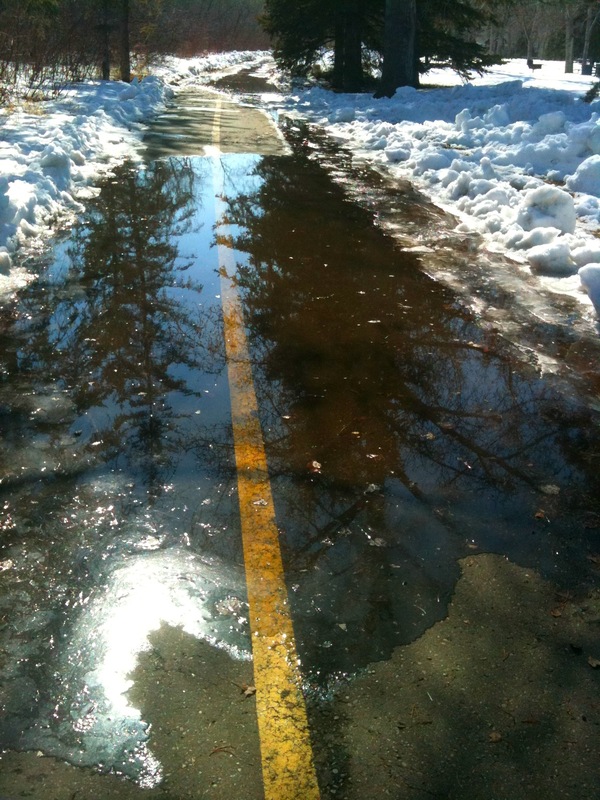 I could have tried to cycle through the snow beside the “lake” or walked through the snow. In the end I decided to just ride, slowly right through the water. It appeared that there was just water over the path, no ice and the depth was probably no more than 10 cm. It was a good decision. 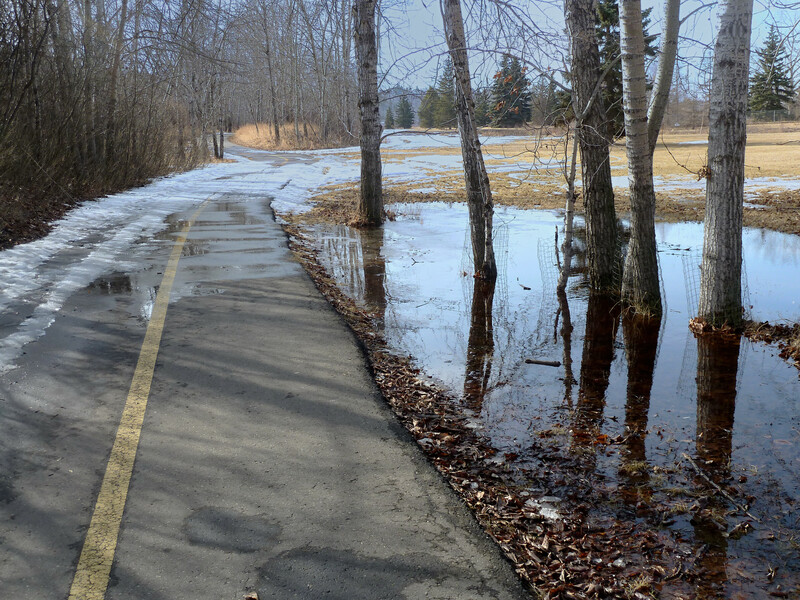 Along the east side of Rundle Park I encountered a few more flooded sections but again, riding slowly through the centre of the path, worked. 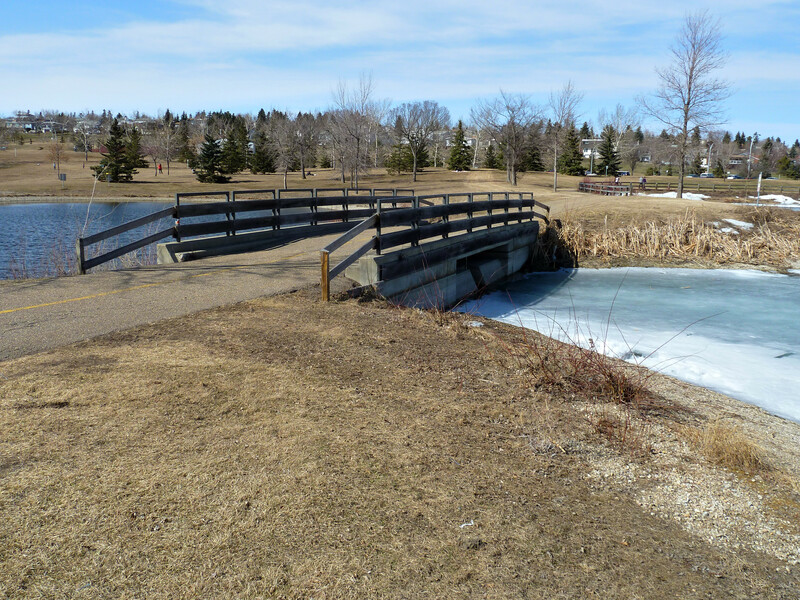 Once around the Rundle loop I retraced my path back along Ada Boulevard and through Dawson Park. The sand continued to build up in my drive train, which always make me feel cringe a bit, but again like yesterday the feeling of being out on two wheels in the sun left me feeling good. I cycled about 20K today with the temperature of only about 3C (still about 5 degrees below average). My conclusions after these couple of early April rides. The riding is in the adventure category. It is not a time for fast cyclng on skinny tires, not a time for multi-hour recreational rides. Hopefully those days will come within a few weeks as the trails and roads dry off and are sweeped of the grit. For now I recommend riding cautiously and sticking to quiet streets and bike paths that are fully exposed to the sun. By all means though, do ride and enjoy the adventuere!